All Aluminum Frame – This provides a rigid frame that helps increase the durability of this mini bow while still making it reasonably light to carry. 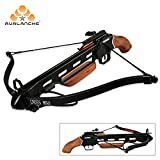 Wood Pistol Grip and Forearm Grip – Very classy look when compared to some of the other crossbow pistols which have plastic grips. Almost gives it more of a pistol gripped shotgun look. 11″ Powerstroke Delivers Speeds of up to 210 FPS – Because it has 150 lb draw weight, it’s no surprise that this is one of the fastest mini bows on the market today. The Avalanche pistol crossbow is over 50 feet per second faster than most of the other bows we have reviewed on this site. Faster speed means more energy transfer to your targets. Mounting Rail – This allows you to add a scope or other attachments to this bow. It doesn’t come with a scope even though the picture shows one. More about this below. We recommend adding a red dot scope or a scope made for a BB Gun to this to increase it’s accuracy. Adjustable Windage and Elevation Sights – This allows you to get fairly accurate with your shots right out of the box without adding a scope if you so choose. Includes 2 – 14″ aluminum arrows – The manual recommends shooting 16″ crossbow bolts out of this but they include 14″ with the purchase. You can shoot both. We recommend going with the 16″ if you want to add different broad heads for hunting small game with this. Easy assembly – This is probably one of the easiest pistol crossbow to assemble. Integrated Safety – The safety on this bow is engaged when it’s cocked. As you can see the Avalanche 150 lb wood pistol grip crossbow has a lot going for it. It’s powerful, quick and well built. But every crossbow is not perfect and the Avalanche is no exception. Here a few of the negatives with this bow. Doesn’t Come with a Scope – This really isn’t a negative as much as it’s a visual misrepresentation. The picture clearly shows a scope on it but it doesn’t come with one but rather the rail to mount one on if you so choose. Not Self-Cocking – Most crossbow pistols are self cocking which makes for easier and quicker loads and reloads. You may want to use a cocking aid with this bow. Larger than most – This crossbow is built on a larger frame than most other mini bows on our site. This allows for the more powerful 150 lb draw weight and the 210 FPS speed which is a good thing. However, it’s larger size might not as good for bug out bags and concealment. Keep that in mind if you are wanting a bow that is really small. Our conclusion – The Avalanche 150 lb wood pistol grip crossbow is the most powerful hand crossbow we have reviewed to date. It’s 210 FPS speed makes it our top choice if your desire is to hunt small game with your crossbow pistol. We hope you enjoyed this review and please check out our other reviews for more great crossbows.